I love using Geogebra! Take a look at the diagram below (use the slider to change the value of n) and then think about how difficult this one simple interactive diagram would be to recreate without the technology. For more Geogebra resources, either check out the official Geogebra website (http://www.geogebra.org/) or the awesome resources shared below to get a feel for what you can do with Geogebra. This video of Michelle Bachmann complaining about Mathematics education is just wrong. My take-away from this video is that Michelle Bachmann has a fundamental misunderstanding of what constructivist teaching is. She doesn’t get it. To be honest though, when you look at educational materials which are shared with parents, they very rarely, if ever, define the purpose behind the pedagogy in language that is accessible to people outside of the field of teaching. Constructivism is a theory of knowledge (epistemology) that argues that humans generate knowledge and meaning from an interaction between their experiences and their ideas. This definition is problematic, not because it is inaccurate, but because it is incomprehensible to a non-academic. It comes across as knowledge is arbitrary. A few weeks ago, I asked people to attempt and define constructivism themselves (in 140 characters or less) via Twitter. Here are some of the definitions. While these meanings may not be enough to explain constructivism to parents in enough detail, they are more comprehensible to the average person, and a much easier place to begin a conversation about what the impact the Constructivist learning theory has on how we should approach education. 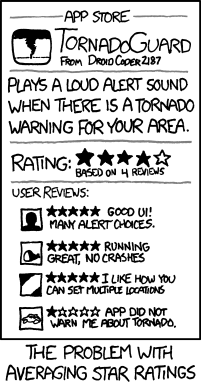 This xkcd comic demonstrates a big problem with averages. By the way, this same problem occurs when you average grades as well.